Hi all - I’ve been super busy with my new job but I stopped by the mall this weekend and found many shirts. Some are from the Uniqlo U spring collection that just launched (and sold out instantly). Others are Gap or BR. With markdowns, all were quite affordable. I wear a lot of buttoned shirts but I don’t need this many more! So I thought I’d see what people thought of them, then choose a few to keep. 1. 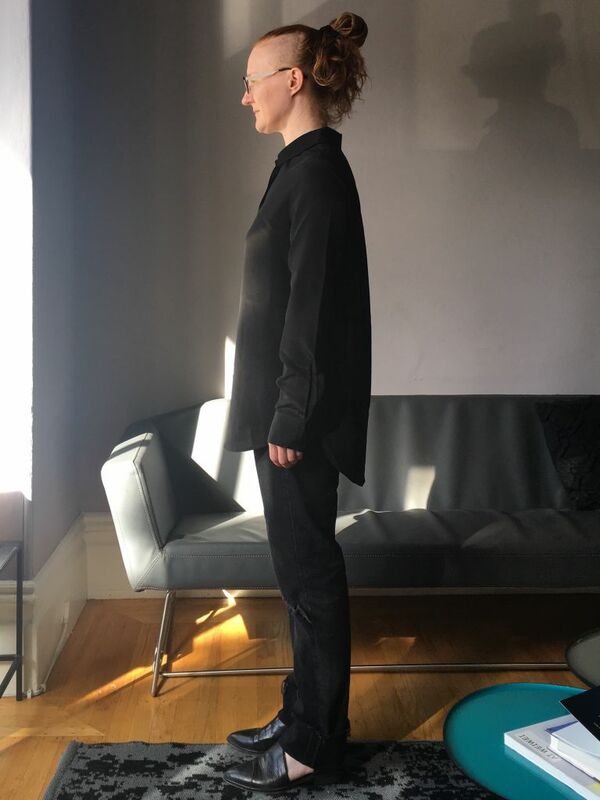 Uniqlo U tunic. I love it. It’s oversized, but so drapey and light that in person it doesn’t overwhelm me. I think I’ll call it JFE and keep it, but the photos reveal that it’s a bit larger than I realized. 2. Uniqlo U stretch shirt. Really interesting shape. Love it, might never wear it because it’s a little more refined than my usual, though I wear a lot of white shirts these days. 3. Banana Republic Quinn oxford. I like how casual this is - goes well with my all-jeans lifestyle. Lacking some pizazz compared to the others but I like the modern cropped boxy fit. But I have another boxy oxford so this is first on the chopping block. 4. Gap denim shirt: first shown in S, then XS. Which size is better? A denim shirt is a HEWI and this is the best I’ve found in years of looking but I wonder how I’d style it to look more put together. 6. 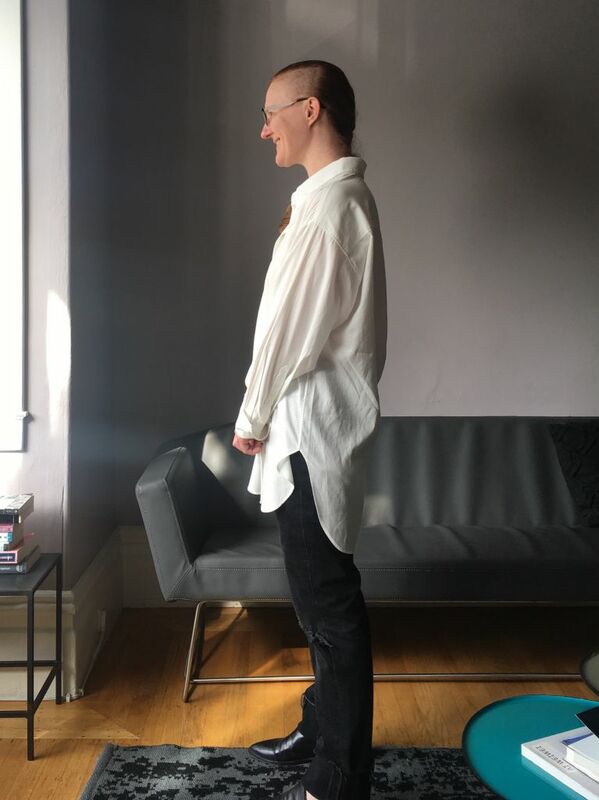 Not button down: silk tee, also super discount from BR. I had to size up to accommodate my chest so the end result is way too big if I don’t tuck it in. But good when tucked in high rise jeans I think? Can you try the first tunic in a smaller size to compare, perhaps? It's an interesting piece -- a little softer than your usual? I like #2 a lot -- it looks fresh and crisp. #3 is a bit meh to my eye. Denim shirt -- it is hard to tell about the size. 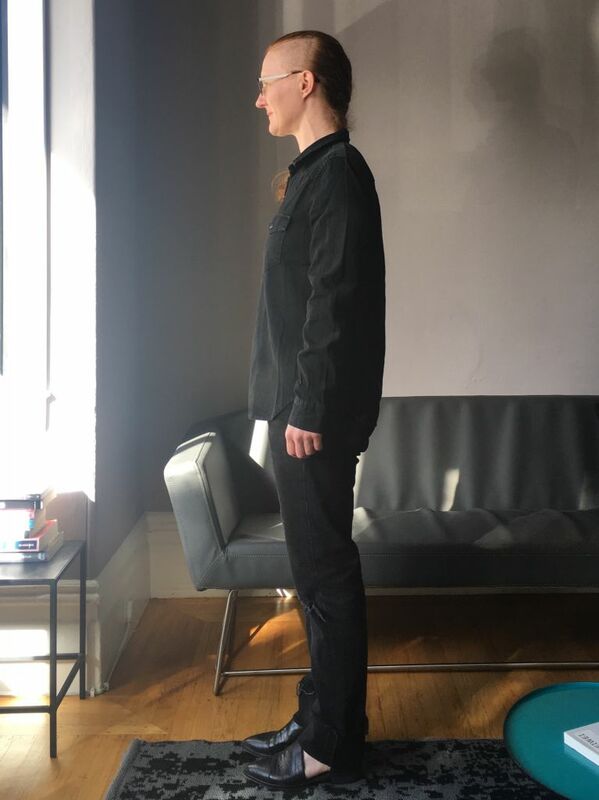 I would do the hug yourself test and also try it with a few outfits as you would wear. I like the silk tunic. Silk tee -- could be a really useful item. Looks fine tucked in. Unfortunately the white tunic is what they call an XS (and they don't make smaller in the US). Like a lot of oversized things, it would work best on someone stick-shaped and taller. I think it's ok on me, but I wish it didn't look so wide in front. I suppose it's possible that it was mislabeled as an XS or something weird, but there weren't any others left in stock to try. I like the style of the tunic in pic 1, but I feel like the fabric is just a bit too voluminous. Too bad that it's already an XS so you can't try a size down. I like both oxfords, with a slight preference for the first one. 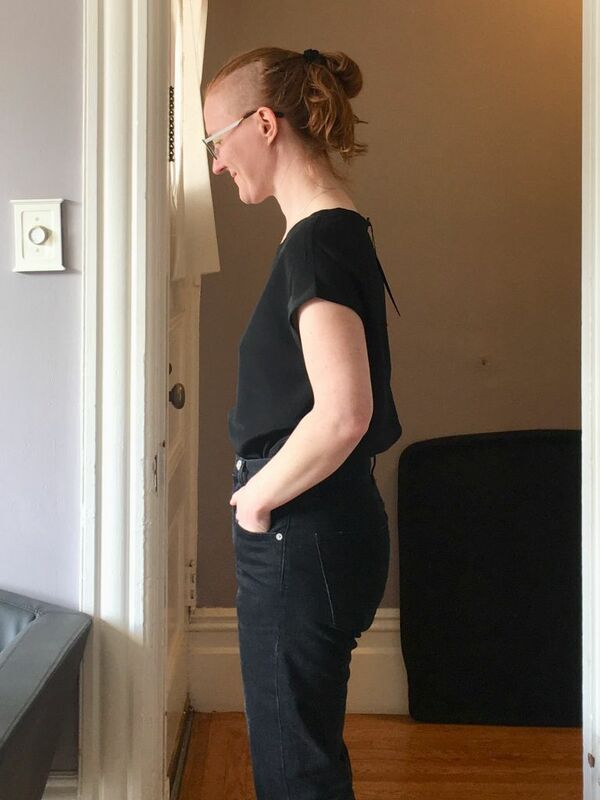 I think the longer length creates better proportions with the dark jeans and dark footwear. On the denim shirt, I think that the sizing depends on the vibe you want the top to have. I feel like the first one (larger size) reads more boyfriend-y, whereas the second one reads more classic. 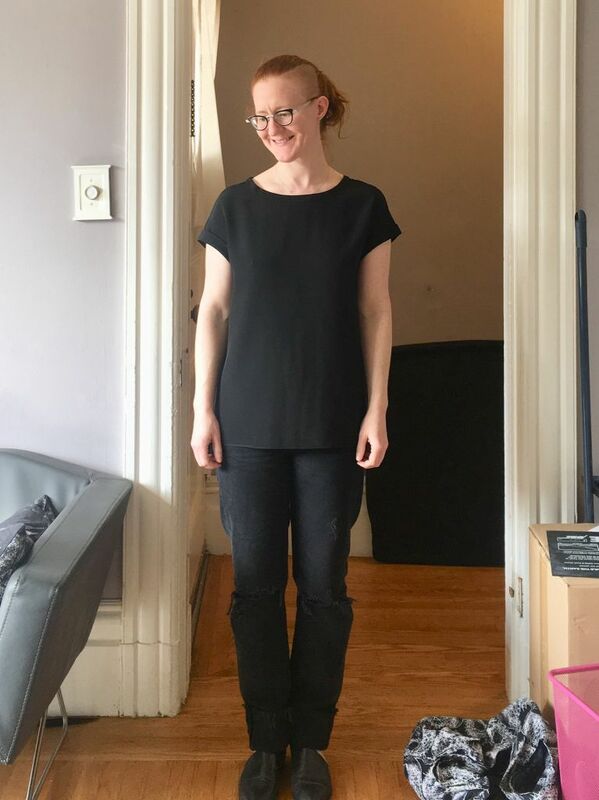 I like the black tunic and the black tee. The black tunic is probably my favorite out of this batch of shirts. I really like the non-button down- definite keeper. 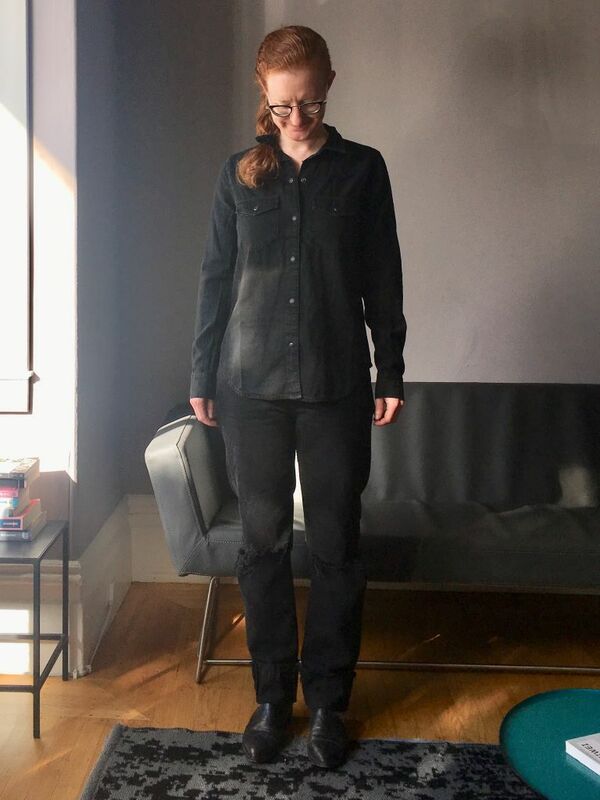 I love the Uniqlo U tunic. That kind of shirt usually looks better in motion in real life than in a still photo. I also love the silk tee both tucked and untucked. I prefer the denim in size S but the other works well too. 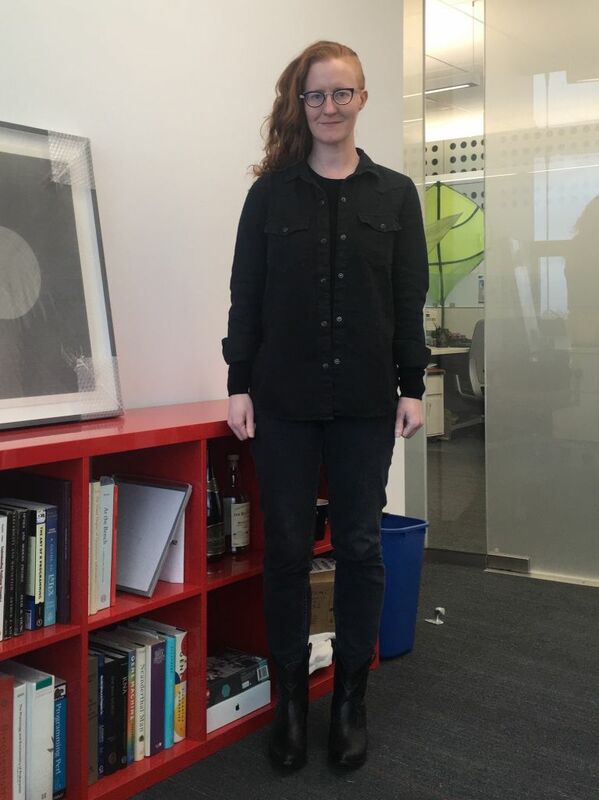 Suz wins with the "hug yourself test" idea - the XS denim shirt is definitely too tight in the chest / armpits. So it's either the small, or neither. Thanks for all the feedback. Still sorting through it, but it seems like the silk tee is a clear winner, and at $30 it's an easy one to keep. I’m with Suz. The only ones I doubt are 1 and 3. The others all look great. On the denim shirt, I prefer the larger size. 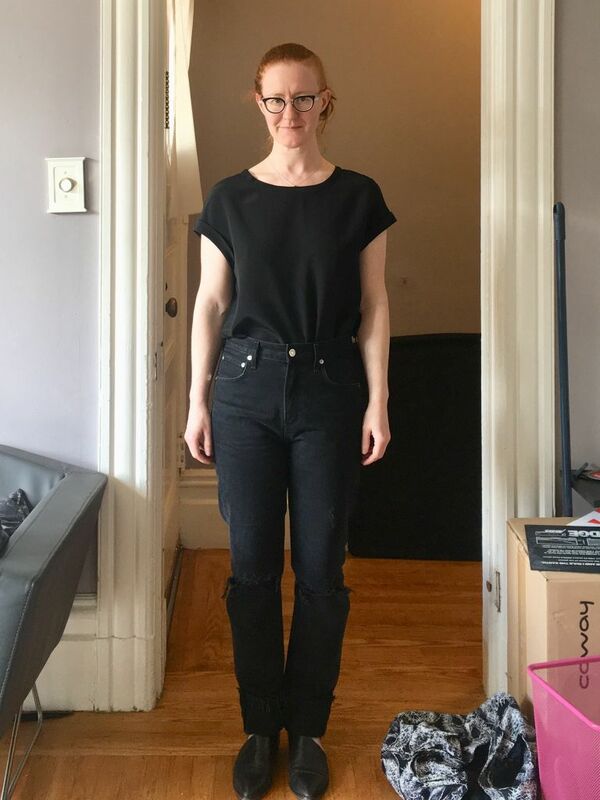 Another vote for the black tunic and black tee. It think the first top is just too big - bummer. 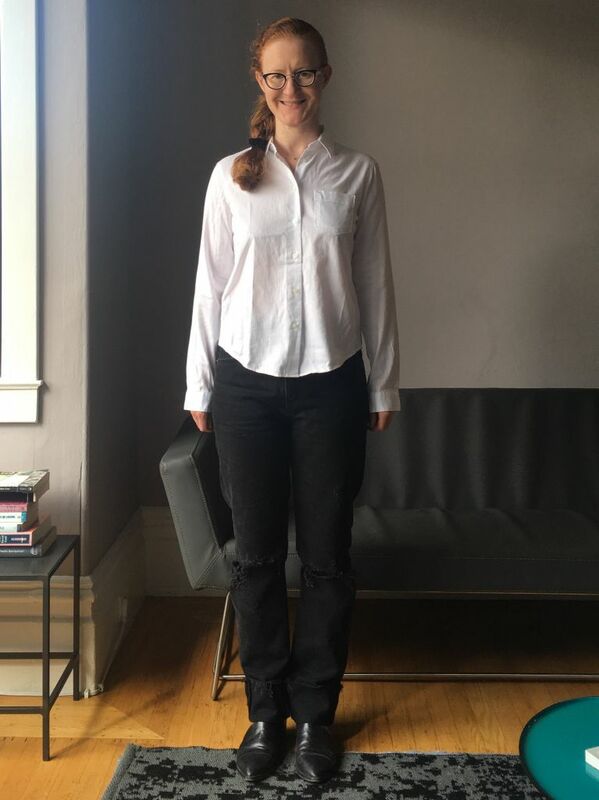 I am not a good one to give an opinion on the white shirts because I don't wear them so am not a good judge and of the black denim I prefer the smaller but agree that it depends on how you want to wear it. I like the silk tshirt, the silk button down with placket, and the larger of the two denim shirts. I love your style - very artistic-minimalist a la Sophia Coppola! Similar to Suz- really like 10/11 and 12-15. 1/2 is fun, so if you enjoy the volume, I'd keep. 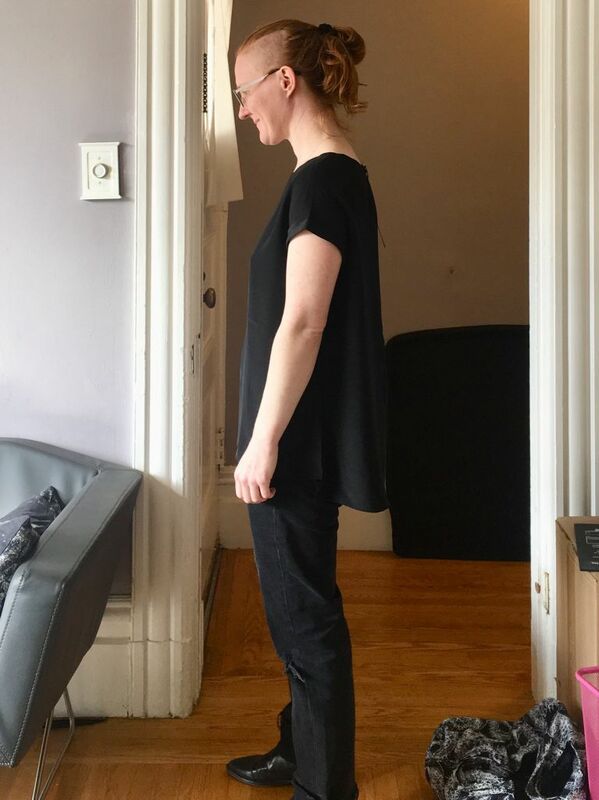 I agree with your assessment that 3/4 is more refined than your typical style, and that 7/8/9 might be hard to style in a way that's "put together" but could be fine for more casual use. 5/6 seems a bit short, so I'd definitely keep 3/4 over that one, if you decide you want a more refined, classic white shirt. I also agree with Suz' assessment. The first one might be fine IRL - I agree with Elle that sometimes photos don't do justice to oversized, flowy items. They look better in movement. 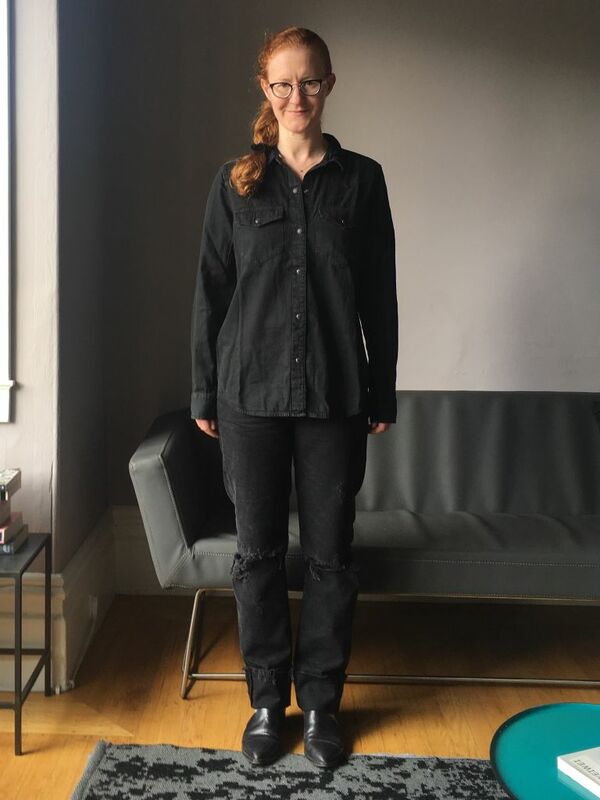 1) the black denim shirt--I like the XS, and I like it just as you are showing it with your black jeans, so that's one easy option for wearing it. 2) black silk tunic. Yes, you can wear this tunic length well. 3) black tee. I think you could wear it with a semi-tuck, letting the back hang free, too. 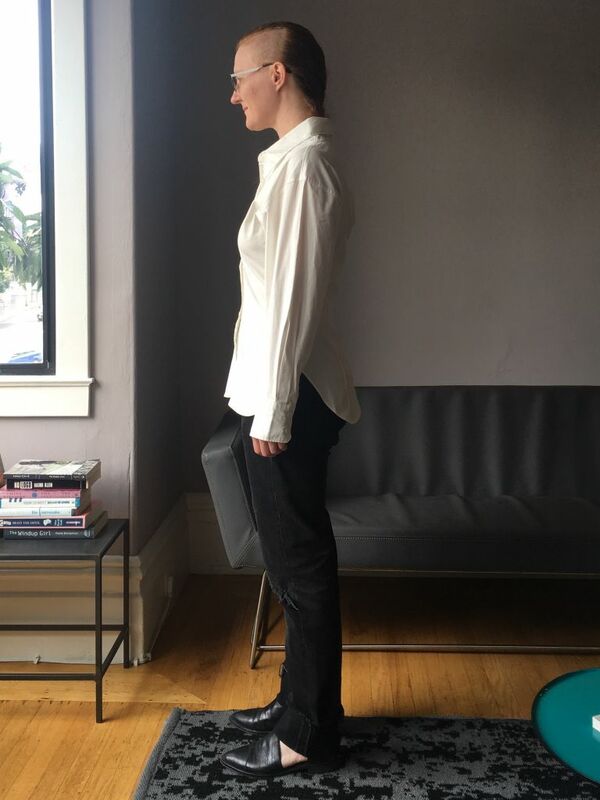 You could always hem it shorter if you want to have a better length for wearing untucked as well. 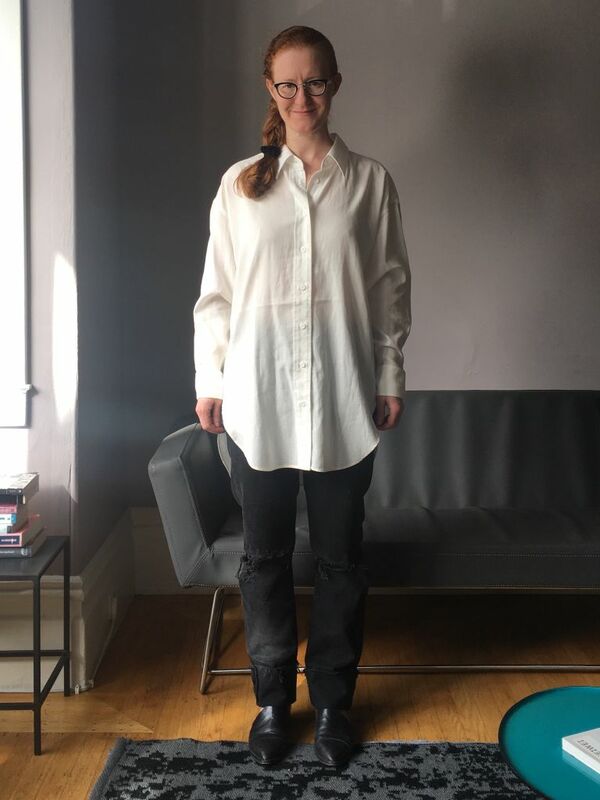 On the white shirts, I do like the idea of an oversized white tunic-length, but I'm not sure this is the one. 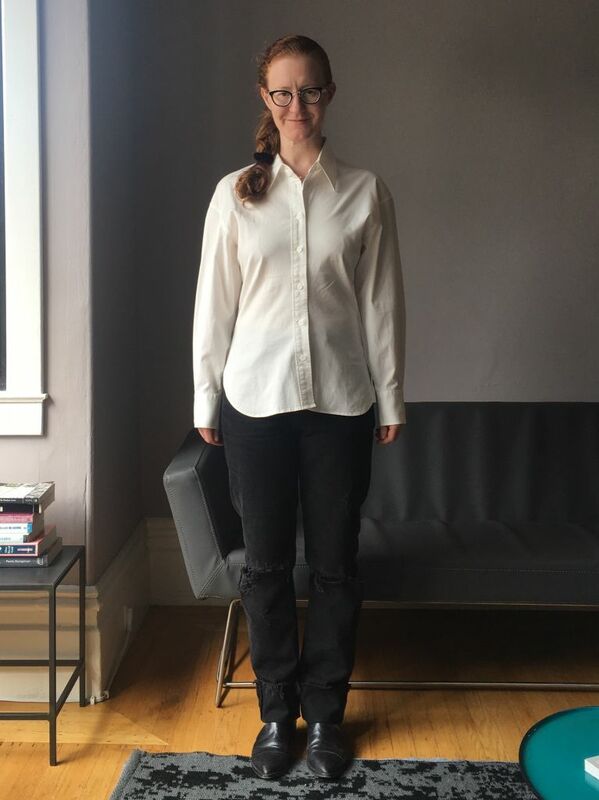 To me, it looks like an oversized men's shirt, and perhaps that is the appeal of the look. I would like to see the sleeves shortened, or worn rolled up. I also like the short boxy white shirt, but if you already have that style covered, the question is whether you need another. And from the side, the sleeve looks maybe a little snug at the tricep on this one? Like all the black tops best; black tunic less than the other 2. 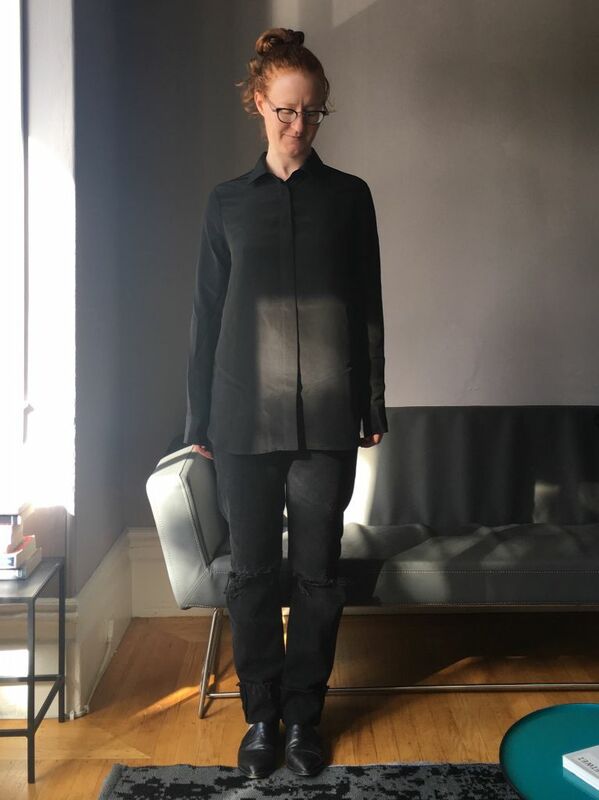 I cut the tags on the larger black denim shirt today! Wearing it over a black ribbed merino top, with the denim shirt unbuttoned and its sleeves rolled up a few turns. 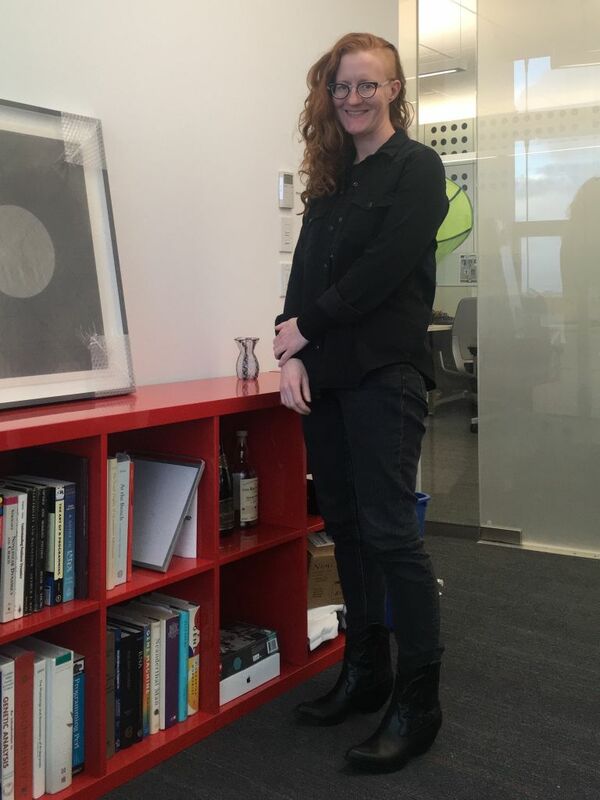 I can't take photos in my new office (glass walls onto the hallway make me self conscious) or I'd post a WIW. Oh yay, the building emptied out before the sun went away, so here’s a WIW in my new office. 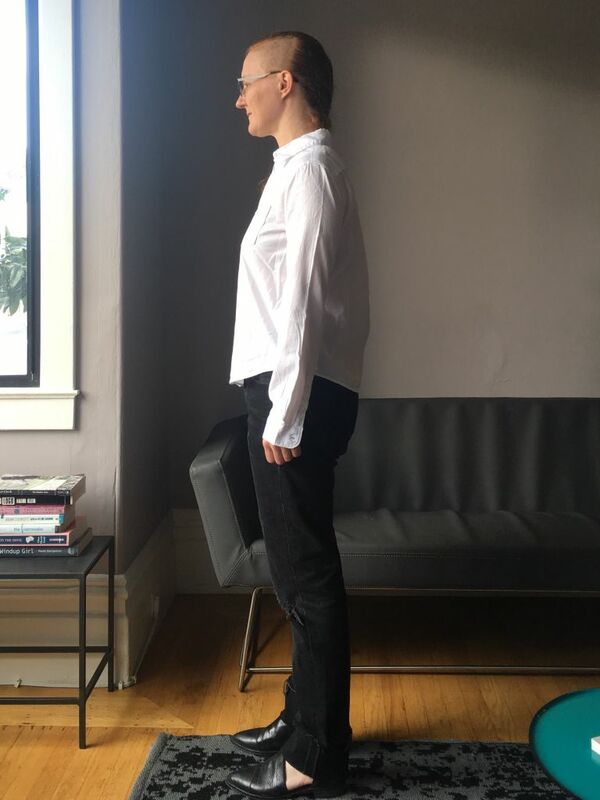 The Gap shirt in the larger size, BR merino top, Everlane jeans, Jeffrey Campbell cowboy boots. I know this is about the shirts... but could I admire the fab boots?! Glad you kept the black, and I like the black silk and the second white top too. The tunic would be better sized down if possible, as the shoulders also look loose. The shorter white shirt may work well with skirts. Super outfit! Glad you kept the gap shirt. It looks very good on you. Ooh, yes, that was definitely the right size to keep. I like all the different textures in your outfit.